Kinderchor der Bayerischen Staatsoper, Chor der Bayerischen Staatsoper, Bayerisches Staatsorchester / Ingo Metzmacher. Stage director – Krzysztof Warlikowski. Bayerisches Staatsoper, Munich, Germany. Saturday, July 1st, 2017. The first premiere of the Munich Opera Festival is always a major occasion with the red carpet rolled out and audience members wearing black tie, long flowing dresses and the occasional dirndl reinforcing the festive atmosphere. For this glittering occasion, the audience entered the auditorium to be confronted with an image of itself. This created a very potent comparison between the audience consuming a work of art and the parallels with the ‘Ritterschaft’ of Genoa wanting to keep the pleasures of Elysium for itself. Die Gezeichneten is undergoing something of a revival right now. 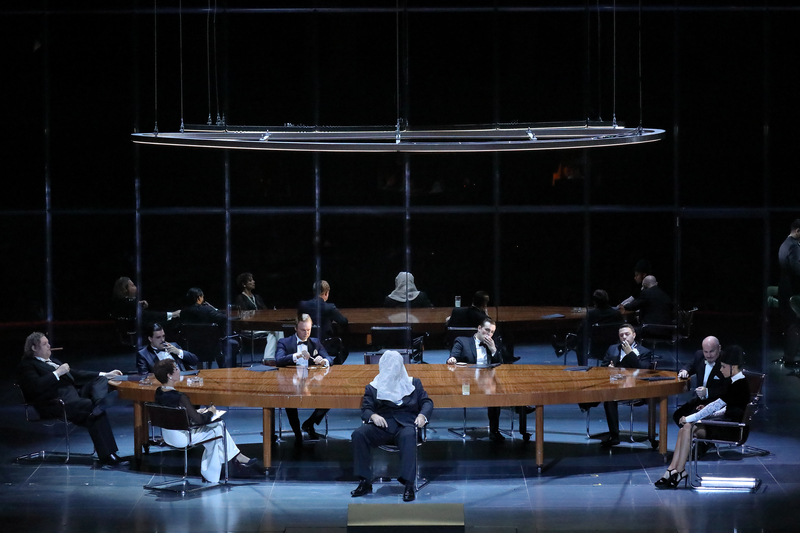 Following tonight’s opening, there is another production opening in Cologne tomorrow night and a new production directed by Calixto Bieito at the Komische Oper in January 2018. It’s a fascinating work, one that deals with sensuality and the sexual awakening of individuals who don’t fit in to conventional society, but also with the relationship between the elite and the people and the need of the elite to preserve structures that maintain their ability to enjoy themselves, often at the expense of the people. We see Pietro, for example, having abducted a young woman to display in a glass case. Naturally, Krzysztof Warlikowski is never a director to take a work for granted. What struck me most about his staging was how married the images were to the colours of the orchestral palette. The work abounds in soaring brass, transparent and filigree strings and moves from delicacy to a blaze of sound in seconds. At the opening of Act 3 we saw a corps of dancers, wearing sparkling diamonds and as they moved in formation, their movement seemed to completely mirror the string writing. As Carlotta reveals herself to Alviano, the sensuality of the orchestral writing, with a rising and descending motif that constantly reappears in the work, suggests that yearning desire that sits beneath the surface – and was also illustrated in how the two characters related to each other on stage, becoming ever physically closer yet never close enough to touch. 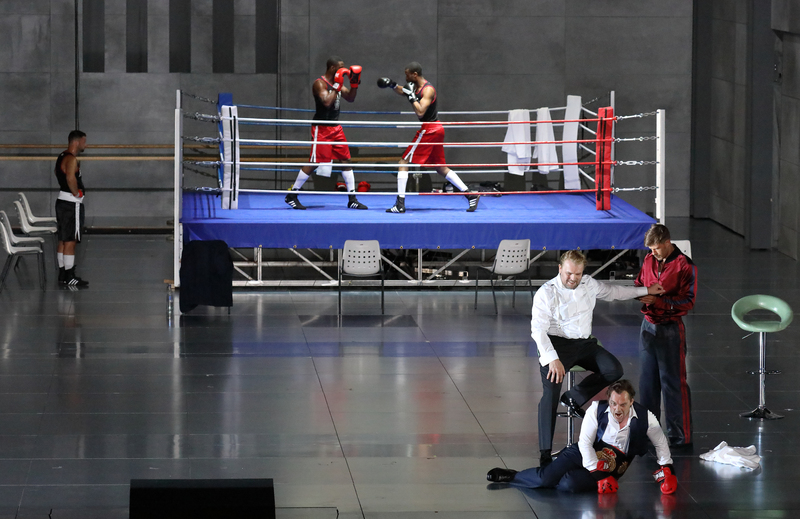 Warlikowski compares the intimacy of the duets between Alviano and Carlotta with the physical brutality of the duet between Adorno and Tamare, accompanied by a group of boxers. The wealth of the aristocracy was illustrated by their wearing of evening dress but also by the imposing set that looked like a corporate headquarters. The people however, wore animal heads and moved in formation, an unthinking mob that only knew how to see but not appreciate what the elite enjoyed. This might seem like an obvious solution but it was one that had immense power. It drew attention to the separation of the elite and the people and it meant that Warlikowski was unafraid to tackle the class issues that are inherent to the work. There were however, a few ideas that were a bit déjà vu. 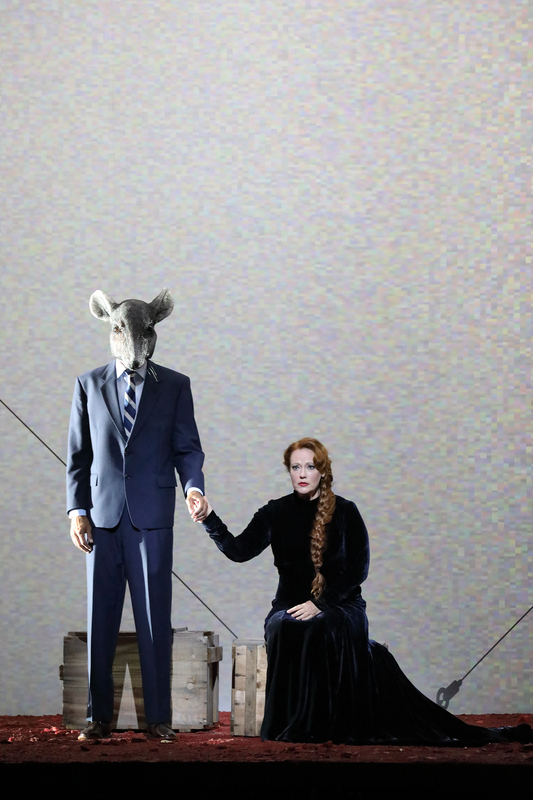 So much of what we saw on stage was used by Warlikowski in previous productions – the clinical conference room setting (Brussels Don Giovanni), the mirrored stage (Paris Iphigénie), the wearing of animal heads (Paris Król Roger) – yet these self-referential nods led to a sense of familiarity that brought the work closer, at least to this spectator. Warlikowski is also not just self-referential. So much of his artistry is based in a profound knowledge of art and literature. We saw nods to David Lynch, Tilda Swinton, Kafka as well as 1920s horror movies, bringing a universality to the work. He also hinted at Schrecker’s Jewishness – the character of Alviano could certainly be said to be a metaphor for the Jewish experience of early 20th Century Austria. Alviano can circulate with the elite and provide them with a service yet, due to his disfigurement, will never be one of them. Likewise, Carlotta is fascinated with him but ultimately gives herself to Tamare – even if she wants to break free of the elite, she is destined to always be a member of it. I found it a potent and fascinating realization. Musically there was much to admire tonight. Ingo Metzmacher led a reading with flowing tempi yet wasn’t afraid to pull back where necessary. Likewise, he gave us textures of beguiling transparency and opened up the orchestral sound to fill the theatre impressively. Metzmacher brought out the mercurial nature of the score – the constant changes of mood from nocturnal half-lights to bright blazes of sound. He was also a most sensitive accompanist to his singers, always allowing them through. The orchestra played well for him. Of course, with it being a first night there were a very few brass accidents and string tuning very occasionally went awry, but the band did acquit themselves very well for him. The chorus impressed by the tightness of the ensemble. The piece was lightly cut. With a massive cast, the work is ideal for a theatre with as strong an ensemble as Munich has and it had clearly been cast with care. John Daszak was fearless as Alviano. His isn’t the most glamorous of tenors but he is incredibly reliable. He has all the notes and sings them well. He has a good, firm and characterful sound with enough lyricism for the duets with Carlotta. If the third act appeared to take him to his limits, with some rawness on top, it was a small part of a very convincing and satisfying interpretation. Catherine Naglestad gave us some ecstatic high notes as Carlotta combined with some beautiful soft singing in the middle voice. 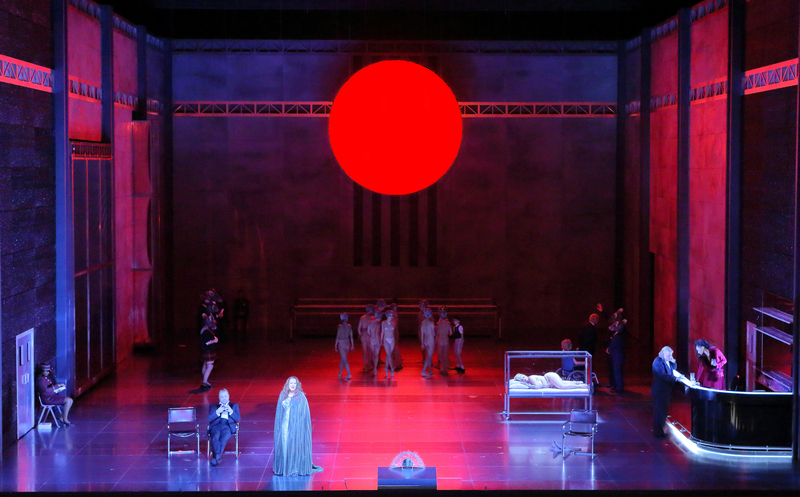 Her soft-grained soprano has a slight tendency to spread under pressure but she definitely has the voice for the role – the heft of a Brünnhilde combined with the lyricism of a Fiordiligi. I was pleasantly surprised by Christopher Maltman’s Tamare. He was in excellent voice. On the last occasion I heard him I was troubled by a prominent beat in the voice but this has settled and he sang tonight with increased heft, focusing the tone into a penetrating beam of sound. He also sang with a lieder singer’s attention to text. There is still some dryness to the tone but he was definitely on good form tonight. Tomasz Konieczny also gave us singing that was attentive to the text. His is also a big voice, absolutely rock solid and even throughout, but combined with completely magnetic stage presence that made it impossible almost to stop watching him – even when wearing a mouse head on a crowded stage surrounded by the ladies and gentlemen of the chorus. The remainder of the cast, as always, reflected the excellent standards expected at this address. A special mention to Heike Grötzinger as a nicely waspish Martuccia and Dean Power as a lyrical and handsomely-voiced Pietro. This wasn’t an evening that gave us all of the answers that the work asks but it did ask us to confront ourselves, starting from staring at our reflection on stage to questioning the nature of power, consumption of art and how we relate to those who are different. The cast was warmly received by the audience and happily for once, the bravos were definitely louder than the boos for the production team. Musically it was graced by conducting that was alive to the multitude of colours in the score and aided by a production that amplified what was created in the pit. It was decently sung by a cast that was dedicated and fearless throughout the entire evening. This is a show that asks questions but doesn’t always give the answers. Much is intimated, even more is left to the imagination. Certainly a remarkable evening in the theatre.